If you're an oily skin girl like me, I know what you might be thinking - "ugh, the last thing I want to think about when I'm captain of the Grease Team is adding more moisture to my face!!" and I totally share the sentiment. But here's the thing: oily skin, even if you feel like you have to blot it 10 times a day, can be dehydrated at the same time. Even though your glands produce excess sebum (oil) your cells may still be lacking the hydration they need. So what do we do? Step away from the lotions and creams and say hello to gels, serums and mists! These are lightweight and soak right into the skin. 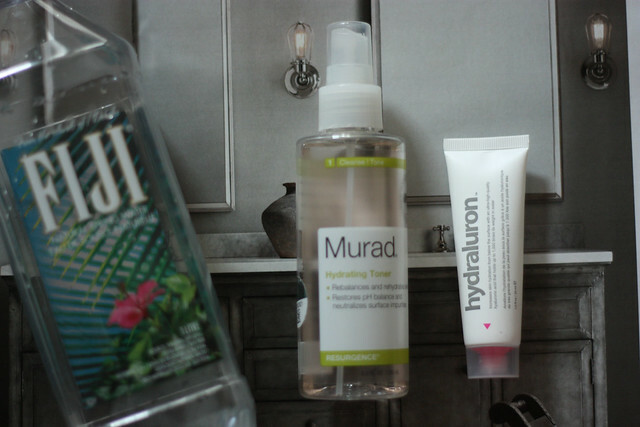 Right now I'm using (every other night) the Murad Hydrating Toner (stick it in the fridge for an even better feeling) followed by a thin layer of Hydraluron serum. The serum is quite sticky and doesn't play that well with other skincare so I stop here. This is why using it every other night seems to work out for me, especially on days where I used a more intensive exfoliating mask/peel (loving Ole Henriksen Lemon Flash peel, still) having a simple rehydrating night-time regimen like this one has worked out quite well. As for the eye area, Ole Henriksen Eye Gel is rocking my world. One of the best under-eye products I have used and I'm gonna shout it from the rooftops. Let's not forget about water either, I know it can be a pain but guzzle up those 2L a day and you'll notice a big difference! Do you have oily skin? How does your routine change in the summer months? This week I'm sharing my current skincare routine over on my YouTube channel and as a supplement I thought I'd share with you the face masks that I use depending on my skin condition. These three masks are tried and true - some I've been using for over a year! Hey oily skin girls! It's absolutely gross outside and you feel like your skin could run its own oil refinery. You wake up in the morning greasy, you go to bed greasy... you're on a budget... WHAT DO WE CLEANSE WITH? This week's subject is from Ole Henriksen. Ole Henriksen is quickly climbing the charts to be one of my favourite skincare brands.